Thanks, Sue! And have a fabulous 2016! So glad you shared these incredible tarts! Lovely presentation and thanks for the recipe for all to enjoy! Thank you, Bernideen! Wish I could deliver a batch to you and sit down and have a cup of tea with you! Thanks so much for your recent visit to my Christmas decorated chandy post, and for the comment. Thank you, Gina! I do hope you'll try it and let me know if you liked it. Maureen, thank you! I really think you'll like them and find them rather fun to make. They look heavenly, Jean. Could you save me one too? I can understand why Mr. Delightful is a bit cautious. He’s nervous. I mean, what do you mean you got distracted by the cat? Last month we were discussing the oh-so-elusive mystery meat in mincemeat and this month you were DISTRACTED BY THE CAT? I’m a dog lover myself (watch what you say, Sully), but cats like me, so I feel a certain mandate to protect them from…from – Ahem. Merry, merry, vegan Christmas to you! Amy, I could never just eat them one day a year, but I do tend to eat waaaayy too many mince pies! Thanks, EHL! Sounds like you have a wonderful tradition going, and it's wonderful that your husband carried it on this time! Kokoskakor is the only Scandinavian cookie I make (so far). Will check yours out! Your tarts look fabulous! I make them just like you do, or rather they look the same with the little stars cutout on top. l plan to make mine next week although it will be bottled mincemeat and not home made. Don't tell anyone! 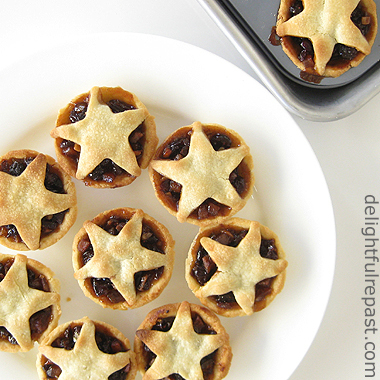 We always had mincemeat pie for Christmas dinner as well as plum pudding when I was growing up. Tomorrow I plan to make my sugar plums and maybe my chocolate peanut butter bars. Next week will be a double batch of donuts and meat pie as well as the tarts. Sandi, thank you! Sounds like you've got lots of cooking and baking to do -- when will you sleep? :D Now you've got me thinking of meat pies. Mmmm. Can't believe we're almost to 2016! 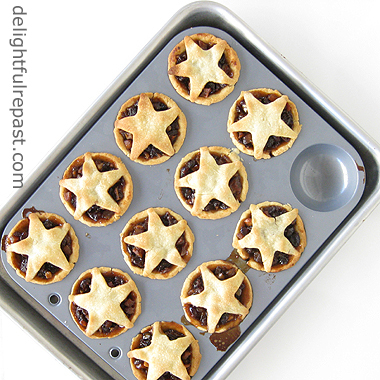 Your mincemeat pies look so pretty Jean. Thanks, Julie! And I hope you have a fabulous 2016! What a beautiful treat, Jean!! Wishing you a very merry Christmas! My, they look and I bet they taste very delicious.. Thanks, Michelle. Much as I love a piece of pie, cute little individual pies are just so, well, cute! Tony, I think of mince pies as simply a winter treat and so eat them throughout the winter months. And Mr. Delightful is getting to quite like them! Happy Baking! Thanks Jean for joining and sharing your wonderful recipe with us at Cooking and Crafting with J & J!! Thank *you*, Julie. Fun to see what everyone is making! I'm loving the star shaped shortcrust topper on these individual gems. Between this post and the previous one, I'm well equipped to get on these sooner than later. Thank you for the details, and all the season's best to you and yours! Thanks so much, Brooks! Your baking is so over-the-top beautiful, you probably feel a lot of pressure to make *every*thing look perfect! Whereas I can just go for "good enough." These are so pretty and sound so delicious! I LOVE mince pies! This reminds me of Christmas SO much. I really need to try making it sometime! The little tarts are just so pretty, Jean! 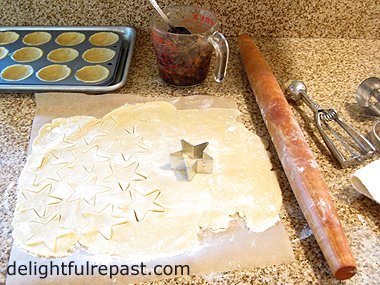 I love the stars on top and the crust sounds so easy, and I'm thinking would be great for other tarts, too. I must confess that I've never had a mincemeat pie or tart, but sure would love to try one of yours. Cathleen, I think you're going to have a lot of fun when you make them! Let me know how they turn out for you. Thanks, Karen! I love sugar cookies, too! Kitty, thanks. That crust *is* good for other tarts as well. So even if you don't make the mince pies, you might find a good use for it. The highlight of our garden club Christmas pot luck dinner is friend Judy's homemade mince pie. After reading your recipe and seeing how easy it is, I'm going to give it a go next year for luckily my husband likes it too. The actual pan for the tarts is interesting with a rounded bottom - thanks for sharing your pastry, and mincemeat recipes. Thank you, Judith. Let me know how it turns out for you. It's especially good if you make your mincemeat about a week ahead of time so the dried fruits have time to rehydrate. 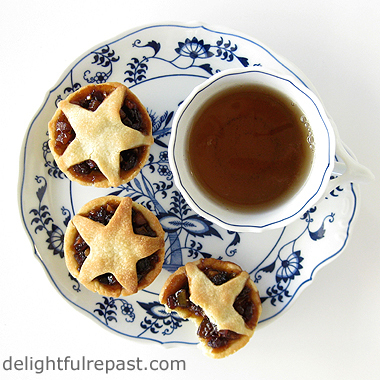 What inviting images of your little mince pies and what an inspiring recipe, I love little pastry, to cook and to eat ! Thank you darling Jean for another precious post ! May your Christmas be the Merriest you could ever imagine and wish, filled with JOY, LOVE, ARMONY, PEACE, HEALTH and FAMILIAR WARMTH, the most blessed and precious Gifts we have. Dany, thank you so much. And I wish you all the best as well! Merry Christmas, Jean! I agree with Daniela....your photos are so amazing and I would love to try one of these pies! Enjoy every minute of this special time of the year. Thank you, Mildred! If I were nearby, I'd bring you a batch of pies; and maybe you could put the kettle on! Looks great!! Love your presentation too!! Thank you for sharing with us at #HomeMattersParty. We wish you a very Merry Christmas and Happy Holidays !!. We would love to have you again when we are back on Jan 8, 2016. Sahana, thank you! I'll look for you on January 8. Wishing you a fabulous 2016! There's nothing like a good mince pie - and yours look fantastic, Jean. Your pastry looks wonderful! Thank you for sharing with us at the Hearth and Soul Hop. Thanks, April! And thanks for hosting the Hearth and Soul Hop! Picture perfect pies! I love the idea of half apple, that would be a great way for us to try them and see what we think of mincemeat. Thanks so much, Lil' Cookies! I hope you will give it a try and let me know how you liked it. Thanks, Swathi! And for pinning and tweeting -- I need all the help I can get! Thanks so much, Miz Helen! And I really appreciate you! Wishing you a wonderful 2016! How cute these are! Merry Christmas! Thanks for sharing at Home Sweet Home! Thank you, TCOH! I just love little individual things! Thanks, Greg! They go great with eggnog! These are as beautiful as I bet they are tasty. I have never tasted or made mince meat pies. Found out last year that it is my fil's favorite. May need to try making some! Thanks for sharing them with SYC. Happy New Year. Jann, thank you! If you make some for your father-in-law, let me know how he liked them! Great with a cup of coffee or tea. Have a terrific 2016. Hugs to you, too. Jean, this brought back SOOO many memories! 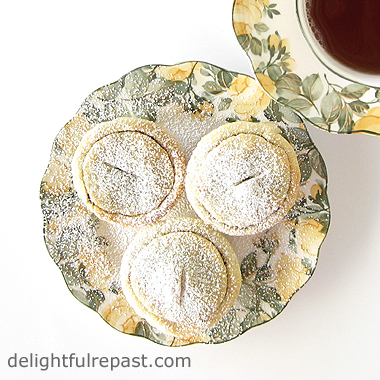 My mother LOVED mincemeat pie & would make it every Christmas. I love your tiny individual servings...so dainty & pretty. I've just discovered your blog via Bernideen's linky party, so I'll get another cuppa tea & spend at least an hour poking around. Thanks for sharing your world! Retta, thank you so much! Isn't Bernideen's linky party lovely? We "tea ladies" are a special group! You'll find lots to do with tea here. Hope you find something else you like. I'm embarrassed to admit that for the longest time, I thought mincemeat pie contained real meat. Hee! Good to know that they should always be served warm. Margie, you're not alone! 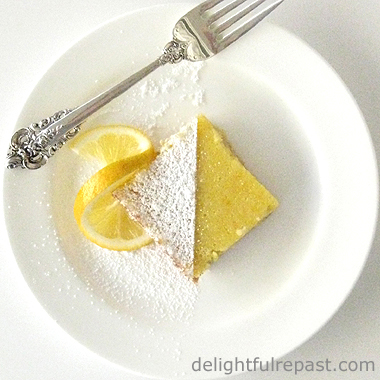 I hope you'll try this soon as they are so perfect with tea! Jean, Mincemeat tarts are my favorite holiday treat. I have been lucky to have them several times. I have not made any myself. Love the blue and white dishes. Thanks for sharing. Sylvia D.
Thank you so much, Sylvia. I hope you'll make my recipe one of these days. They really are fun to make! These look amazing and are making me hungry! I must ask, what is the pattern of your blue and white dishes? I am OBSESSED!!! Heather, thank you. These little pies are addictive! I love all kinds of blue and white china, but this - Blue Danube - is my favorite pattern, with the classic blue onion design. I use these "snack sets" all the time.